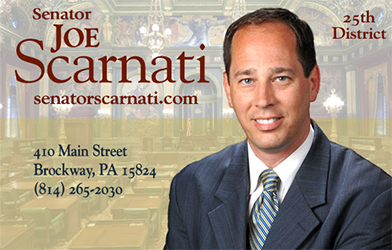 Senate President Pro Tempore Joe Scarnati is currently serving his 4th term in the Pennsylvania Senate. As President Pro Tempore of the Senate, he holds the third-highest constitutional office in the State. He was born and raised in Brockway, Pennsylvania and represents the 25th Senatorial District, which includes Cameron, Clinton, Elk, Jefferson, McKean, Potter and Tioga Counties and portions of Clearfield County.